This is extremely disturbing and I can't stand when incidents like this happen. Because there's no victory in lives lost. But hope the people of NZ can do something to make sure this doesn't occur again. Ive seen people saying and providing proof that the video is staged??? Is it true? i'm actually extremely uneasy about this. while the story is indeed getting plenty of worldwide coverage, it feels like an international bubble has burst. i.e., the world is covering it, and talking about it, and expressing remorse, but no one knows how to actually process it and act on it. because what comes after an islamophobic terrorist attack perpetrated by a male white supremacist in 2019 and in one of the most harmoniously perceived countries in the world? something meticulously designed to burst that bubble? the terrorist laid it all out for us in his manifesto. he's clearly one of the most depraved humans alive but he delivered what the rapidly growing alt-right have only dreamt of. and with trump setting the tone of "how much white supremacist dog whistling can the US president get away with? ", it's hardly a surprise we lack a semblance of unity when the bubble has been the elephant in the room this whole time. i actually don't think distance from NZ is a factor here. the world is more interconnected than ever via technology and everyone recognizes NZ and AU as western democracies. with the attack in such a small and innocent country validating the worldwide xenophobia issue, every country is being forced to feel the tension... in their own country. there can be no unified western front because: trump. it feels like this is being digested more online, notably twitter, than in the real world. none of my friends or family have brought it up at all despite being varying scales of liberal. 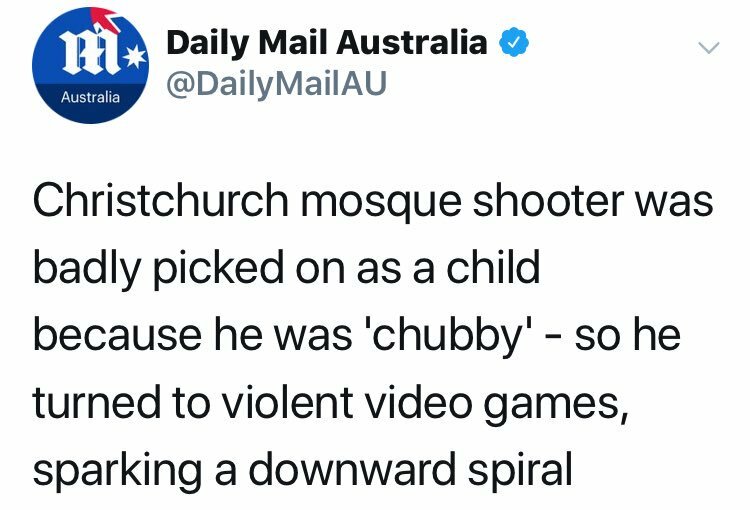 there seems to be a certain chunk of people who understand the modern weight and relevance of this attack and actively seek out like-minded people to talk about it, but the rest see it as just another of those shootings they've become desensitized to. It isn't the physical distance, but the psychological distance. What are the chances you find yourself in a mosque? For the majority outside the religion, it's as unlikely as flying into space or going to the moon. The airport in Brussels, a cafe terrace and a concert venue in Paris, an arena in England,... are more likely places you can find yourself in. Sounds like something a white supremacist would say. Unless they seriously think all the dead bodies and the medical experts and police that investigated the crime scene and the police the apprehended the shooter by ramming his car are all part of a conspiracy to take away their guns. I don’t really [think white nationalism is a rising threat]. I think it’s a small group of people that have very, very serious problems. A Twitter post containing a photo of a gun and captioned "You are next" was sent to the New Zealand leader. Another post tagged to Ardern and NZ Police and had the same photo with "next it's you". The suspended account contained anti-Islamic content and white supremacist hate speech. Some links between these identitarians and some other familiar names.